After having recently binged on several doses of technically daring albums, “Electric Guitars” felt like a sweet hangover cure. No, originality is not on the band’s agenda and the music is a throwback to the glory years of Deep Purple, ZZ Top, Glenn Hughes, Buddy Guy, Led Zeppelin, April Wine…..you get the idea. Hell, even the moniker must be the most unoriginal one I’ve ever heard of. Thing is these songs are quite well-written and excellently played. The rhythm section is solid and precise; the vocals are warm, bluesy and powerful; the guitars screaming hot. There are what felt like a couple of fillers but even those songs weren’t too bad either. Besides an embracing of 1970s Rock, abundant hooks and groove make up the DNA of all the songs. ‘Baby I Love You’ is one of the more memorable tracks within this context. ‘Horsefly’, on the other hand, is slightly different from the other songs. Its main riff is very Doomy but the melodies have subtle hints of The Flower Kings and Dream Theatre. 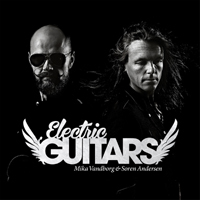 For the curious, Electric Guitars is a Danish band centred around the axework of 2 guitarists: Mike Vandborg, who has played with a number of local Danish bands besides having already released a number of solo albums; and Soren Andersen, who has worked as a sound engineer as well as a session guitarist for musicians such as Glenn Hughes, Mike Tramp, Joe Bonamassa, Billy Sheehan, Dave Mustaine and others. Together with Peter Kjøbsted on bass and Morten Hellborn on drums, Mike and Soren have here crafted what gives the impression of being a labour of love. No more, no less. It’s just Rock ‘N’ Roll, and I like it.